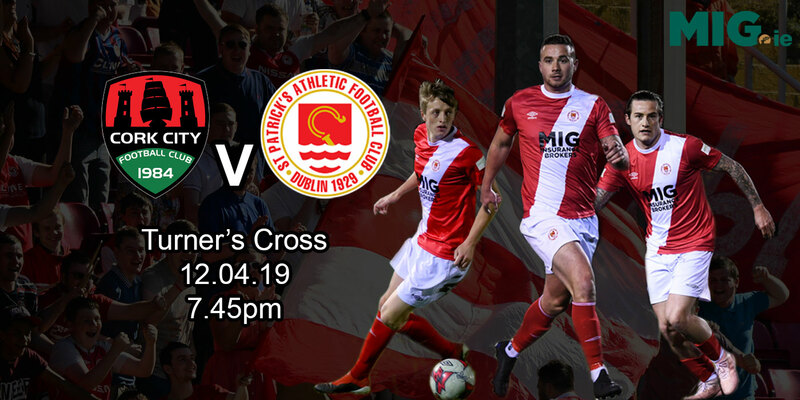 St Patrick's Athletic travel south to Turner's Cross to face Cork City in the SSE Airtricity League on Friday night (kick-off 7.45pm). Harry Kenny's Supersaints will be hoping to replicate their result from the opening night of the 2019 season when they defeated the Leesiders 1-0. On that occasion, Mikey Drennan's first half penalty earned Pat's the three points. The Saints head into the game on the back of a 1-0 win over league champions Dundalk last week in Inchicore, as an own goal from the Lilywhites' defender Daniel Cleary decided the game. In team news, the Saints will be without Drennan who serves an additional two match suspension following his red card against Bohemians. Harry Kenny however is boosted by the return of winger Dean Clarke who has recovered from concussion, while Brandon Miele has returned to training following an injury and will face a late fitness test. Looking ahead to Friday's game against Cork, Kenny told stpatsfc.com that while the players and staff were happy with last week's win over Dundalk, they know they have to continue the hard work in order to put a run of results together. "The win over Dundalk was great and I was delighted for the players as they really worked hard to get that result. There was a great togetherness from everyone between players and supporters. We played reasonably well when we had the ball and we were very solid at the back." "We have been playing reasonably well without getting some luck or taking chances when we have created them. On this occasion, that little bit of luck that we have been missing was with us as Rhys [McCabe] got onto that great flick on by Gary Shaw, and the cross went in to the goal from an own goal," Kenny said. Reflecting on the earlier clash in the season against Cork and the challenge of travelling to Turner's Cross on Friday, Kenny admitted the players were excited ahead of what will be a tough game. "Cork were very difficult opponents for us earlier in the season. Turner's Cross is a hostile place and a difficult place to get a result. From our point of view, we need to replicate last week's performance. We need play with the same tempo that we did against Dundalk, play with the same composure and be up and at it. If we perform like we did last week though, I'd be confident we can come away with something. I'd like to think we have that bit of confidence back and hopefully that will lead to us picking up a result on Friday."